Just a quickie to let you know there will be no Relaxed group this week. 1. We're going to start at 6:30am ( not 6:45 as stated previously). Please be at Constantia Nek by 6:25 for check in! 2. WATER! Bring at least a litre. It's going to be 19°C when we start and we will be sweating from step 1. NB: There has been an incident of theft from a vehicle at the Nek recently so please make sure you don't leave any valuables visible in your car. This week we will be doing our old, familiar Vlakkenberg route – in reverse! Instead of the leg-deadening uphill slog behind the Silvermist restaurant, we'll start our run more gently by heading a little further down the main road until we see the pipe track on our left. We'll head up and along the gently undulating jeep track, all the way along behind the houses until we reach the turn up into Bokkemanskloof. Here we'll climb the mountainside between the cool vegetation and pop out on the plateau at the top. From here we'll hang a right toward Picnic Rock for the customary group photo. (The Faster group may decided to run on to the Manganese Mines from here.) Photo snapped, we'll turn on our heels and make our way back to Vlakkenburg Peak itself, before heading down the steps behind Silvermist restaurant, and back to the cars. 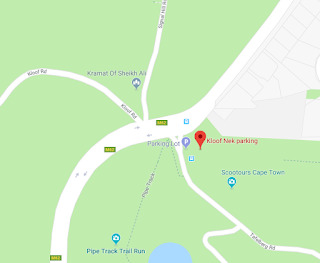 Meet at Constantia Nek car park ready to start running at 6:45am. Please arrive early for check-in and safety briefing. This route is made up of jeep track, single track, and steps. The main group will cover about 11km in 2 to 2,5 hours. Water – lots! It's going to be a very hot day. Also a whistle, a space blanket and your ICE information . It is getting warmer these mornings so please don't forget to put on sunblock before you leave home. Meet at the Silvermine Gate 1 car park (immediately left after the entrance gate) ready to start running at 7:15am. The gate opens at 7:00am. Good Luck to the runners and cyclists who are taking part in the Steam Train Challenge. Just a reminder that the cut-off date for T-shirt orders is this Friday 19th October. Please make sure you have your order submitted to Gaeleen to avoid disappointment! and back down the Riverwalk or MTB path to the carpark. Rendezvous and start timeMeet at the Silvermine Gate 1 car park (immediately left after the entrance gate) ready to start running at 7:15am. The gate opens at 7:00am. Please note: The entry fee is now R50 unless you have a MyGreen card. Remember to bring your ID book too. Terrain and distanceSingle track and jeep track, some climbs. About 12-14 kms, taking around 2.5 hrs. Our runs are pack runs and we will therefore regroup as necessary and leaders of each group will ensure that no-one is left behind. Please keep the groups together and ensure that no-one is left on their own. DogsPlease note K-Way VOB club rules do not permit dogs on our runs. Coming from Cape Town, turn right off Ou Kaapse Weg to Gate 1 Silvermine. Single track and jeep track, some climbs. About 12-14 kms, taking around 2.5 hrs. The Medium group will follow the same route at a more modest pace. Or their leader may decide to take a shortcut. Water, whistle, warm/windproof top depending on weather. Space blanket (Check it's condition please) ICE (In Case Of Emergency) ID - bracelet / tag, card in your backpack.